Heliceum’s Human Defense has introduced quite interesting gameplay mechanics to differentiate itself from other tower defence games. Human Defense is played very much like a tower defence game; by placing defensive towers to shoot down enemies travelling a set path for them to follow. However the towers can only be placed in pre-determined spots so you’re going to have to think about what kind of tower should be built in that particular spot. Additionally just like most games in the App store, it has taken a standard 3-star ranking system for each level to verify how well you have done. 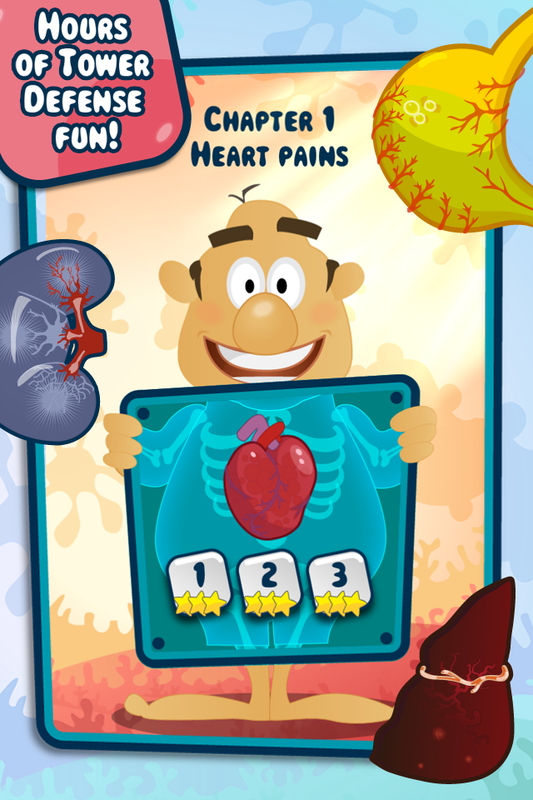 So the point of the game is to stop the bacteria from reaching the end of its path so you can keep the organ healthy. One interesting gameplay mechanic is allocating energy in the form of carbohydrates to towers in order for it to function. Carbohydrates will come out at the start of the level, follow the set path and enter the initial tower where it is needed. There are different types of enemies marching towards their destination and each have their own weakness against various towers. 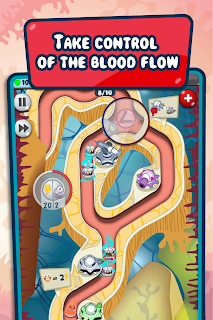 In later levels you are able to change the path of the enemies and energy so they go in the right direction. Energies that are lead into a body part will make it healthier to a certain extent; this gameplay mechanic tests your reflexes as you decide on how much energy should be in that route as they travel at quite a speed. The tower placement spots as mentioned before adds a puzzle mechanic into the game as you figure out which tower should be in that specific spot to effectively eliminate enemies. Having this idea, players are forced to figure out the winning strategy in order to move on to the next level with a 3-star rating. Players are also able to purchase pills in the Shop menu to help them complete levels with a bit more ease. 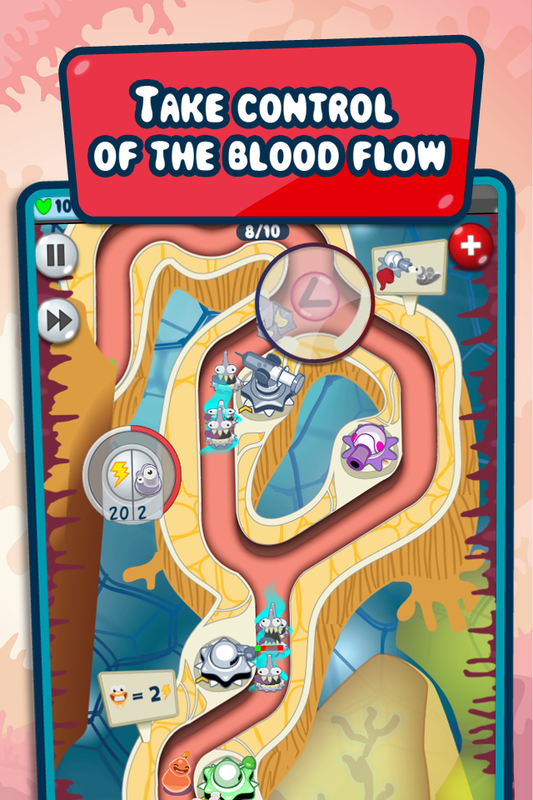 The game uses bright colours to make it look as lively as possible; with cartoony animations and art style makes it very easy to be attracted to. However the human body theme isn't too appealing but cuteness is achieved to a certain extent in order to add an up-beat background music, despite it's idea of body parts being infected with deadly viruses. More than just one chapter to run through. The main attraction this game has is the gameplay as it has taken a different approach to how tower defense games are played. It offers two game modes and these are; Adventure and Emergency mode. Emergency mode can only be played after completing chapter 3 in Adventure mode. Meanwhile, Adventure mode contains 5 chapters with 3 levels in each totalling to 15 levels and more to come this summer. Human Defense contains new mechanics that most tower defense games doesn't have, but these mechanics are not appealing enough to draw attention. People who aren't keen on tower defense games will sort of feel that Human Defense is just like every other game in the genre, but fans will certainly appreciate what it has to offer. So to people who are looking for a new twist in tower defense games, Human Defense is a definite.